Sheffield Wednesday came back from two goals down at half-time to earn a point at fellow play-off hopefuls Cardiff. Craig Noone put the hosts in front from the penalty spot after Tony Watt was fouled by Owls keeper Keiren Westwood. Anthony Pilkington beat the offside trap from Joe Ralls' pass through, rounded Westwood and rolled in for 2-0. But Fernando Forestieri brought his side back into it with a low drive, before Barry Bannan smashed home from Ross Wallace's cutback to level. Bannan's first goal for Wednesday meant his side, now in eighth place, stayed level on points with the home side having lost just once in 14 league games. Russell Slade's Bluebirds started the day in the top six, but dropped out following Ipswich's victory at MK Dons in the day's early kick-off. After a slow opening at the Cardiff City Stadium, Watt broke through on goal, and Republic of Ireland keeper Westwood could only bring him down, allowing Noone to slot home his third of the season. Joao came closest for Wednesday in the first half, but his effort from Liam Palmer's cross hit the post and landed into the arms of Cardiff keeper David Marshall. Pilkington's brilliant effort doubled the lead, before Westwood denied Cardiff a third first-half goal with a superb save from Watt. Kenwyne Jones then had a header ruled out for offside and Pilkington headed over unmarked from six yards. Wednesday, who switched to a diamond formation after the break, were back in it when Forestieri opted to shoot with no passing options available. And after Ross Wallace and Bannan both hit free-kicks just over the bar, the pair combined to bring the visitors level. Noone almost grabbed a late winner for Cardiff, but Westwood was at his best to keep out his shot as Slade's side surrendered a two-goal lead for the second home game in a row - having done so against Burnley in November. "We had chances to kill the game off at the end of the first half and the start of the second half. But we looked open at times and for their goals we have simply not done our jobs. "It is a balancing act we need to get right. It is not about any one man, we have to do the basics as a team. "If you don't they prove costly. You have to get to the ball, close down, make a block and defend properly. It's about discipline." "In the second half we were excellent We came on strong, we began to attack and we got the goals back. It was an exciting finish and there were chances for both sides to score and win the game, but I think in the end a draw was the correct score. "We are not normally that open and when we do that we know we are taking risks but we know we can score goals. "As they say in Portugal, we put all our meat on the fire in that second half. It was a fantastic effort, the fitness of the players is fantastic. "But more important than this is the soul and the spirit we have. It is a good sign for us if we can do that against a big team in this division." Match ends, Cardiff City 2, Sheffield Wednesday 2. Second Half ends, Cardiff City 2, Sheffield Wednesday 2. Attempt missed. Glenn Loovens (Sheffield Wednesday) right footed shot from the centre of the box is close, but misses to the left. Assisted by Barry Bannan with a cross following a corner. Corner, Sheffield Wednesday. Conceded by Lee Peltier. Attempt blocked. Fernando Forestieri (Sheffield Wednesday) right footed shot from long range on the left is blocked. Assisted by Barry Bannan. Corner, Sheffield Wednesday. Conceded by David Marshall. Attempt saved. Barry Bannan (Sheffield Wednesday) left footed shot from outside the box is saved in the centre of the goal. Substitution, Cardiff City. Fabio replaces Anthony Pilkington. Corner, Cardiff City. Conceded by Keiren Westwood. Attempt saved. Aron Gunnarsson (Cardiff City) left footed shot from outside the box is saved in the bottom right corner. Assisted by Joe Ralls. Attempt missed. Tony Watt (Cardiff City) right footed shot from the right side of the box is close, but misses to the left. Attempt blocked. Anthony Pilkington (Cardiff City) right footed shot from outside the box is blocked. Assisted by Joe Ralls. Corner, Cardiff City. Conceded by Daniel Pudil. Attempt blocked. Craig Noone (Cardiff City) left footed shot from the right side of the box is blocked. Assisted by Aron Gunnarsson. Delay in match Michael Turner (Sheffield Wednesday) because of an injury. Attempt missed. Aron Gunnarsson (Cardiff City) left footed shot from the centre of the box is too high. Assisted by Tony Watt following a set piece situation. Sammy Ameobi (Cardiff City) wins a free kick on the right wing. Attempt missed. Joe Ralls (Cardiff City) left footed shot from a difficult angle and long range on the right is close, but misses the top left corner from a direct free kick. Tony Watt (Cardiff City) wins a free kick on the right wing. Goal! Cardiff City 2, Sheffield Wednesday 2. Barry Bannan (Sheffield Wednesday) left footed shot from the centre of the box to the bottom left corner. Assisted by Ross Wallace. Lucas João (Sheffield Wednesday) wins a free kick on the right wing. Michael Turner (Sheffield Wednesday) wins a free kick in the defensive half. Attempt missed. 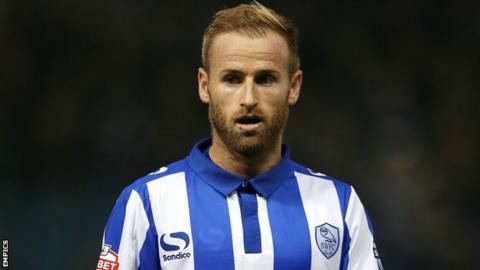 Barry Bannan (Sheffield Wednesday) left footed shot from outside the box is just a bit too high from a direct free kick. Sean Morrison (Cardiff City) is shown the yellow card.